While we work on the content of our new website step by step, check the video for our latest release called 22 Reasons. The world-known music magazine Dance Euphoria published the mention about our release (22 Reasons on Dance Euphoria). The second album done by Five Josephs project has been released on 25th of September 2009. Ondrej worked on this monumental downtempo orchestral huge story over one year. The Sun System album is inspired by our Solar System, where the third planet from the Sun is our lovely Earth. You can get on board to the virtual space ship and let the music to flow over you. Nice mood and feelings are everywhere around you. Starting the virtual travel from the Sun, the hottest place in our Solar System and going to visit at the first place, the warmest planet – the Mercury. When you pass the Mercury over, the Venus sends a warm welcome to the galactic traveller. Hoops, we are nearby the Earth, the most familiar planet in our system, which is known well by everybody, because we live there. When we was small guys we dreamed about space travels. The Mars is close to us and it’s the 4th planet on our music illustration for the journey. Later on our trip, the area of gas giants – the Jupiter, the Saturn with it’s rings, later the dark Uranus and the very calm and cold Neptunus – all of them visited in the music journey. The farest “planet”, the Pluto, is on the trip schedule, although nowdays the Pluto is not marked as planet, but we keep it on the list. 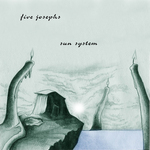 The last album track called the Sun System is the monumental hype of this nice and huge epic music composition. All, The Sun System, release details, including tracklist and samples for all tracks are ready for you on the Sun System release page. Five Josephs decided to release all own music in the album by album manner. There is hidden a huge bag of the work behind the each album. Almost every particular album took around 1 whole year to be produced. And we finally started to release them to the audience. Hope you will like our music. 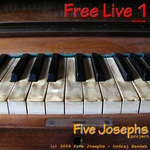 The first released Five Josephs’ album is the Free Live 1. It’s the kind of the music on the edge between the leftfield and the downtempo genres. Check out the release information for Free live 1. The tracklist and all track samples are available at the release page.